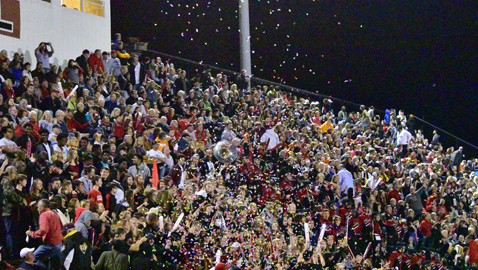 PHOTO BY LEXIE GILLAND/ FUL.COM Confetti falls on Central High fans and band members during the football game's opening kickoff Friday night at Dan Y. Boring Stadium. Fulton also fell 20-6 in the Class 4A state quarterfinal game. It’s Central’s turn to win a Class 4A state championship for Knoxville. Catholic did it last season and Fulton the three years before that. Even Greeneville, just a little ways up the road in Region 1, captured the 4A title in 2010 and 2011. Can the Bobcats keep the streak going? They are two wins away from hoisting the gold football after posting a 20-6 victory over Fulton Friday night at Dan Y. Boring Stadium. That was a fine way of thanking the Falcons for knocking out No. 1 ranked Catholic the week before. Central therefore moves on without having to face the Irishmen, who ripped the Bobcats 49-19 in Week 3 of the regular season. But that’s how the pairings fell. Central avoided Catholic in the playoff bracket because it beat the Falcons 21-19 in their regular season meeting in Week 11. The playoff rematch wasn’t nearly as close. Jadarius Sackie, 5-6, 220-pound senior running back, carried the ball 39 times for 191 yards and two touchdowns to lead the Central attack and the Bobcats’ defense shut out Fulton after giving up a touchdown on the game’s opening possession. Central (11-2) will play Marshall County (12-1) in the semifinals Friday night at Lewisburg. The Tigers earned their shot at the title game with a 53-13 win over Spring Hill. The Bobcats have won 10 in a row. “They still don’t respect us until we win the state,” said Tony Reeves, senior wide receiver and defensive back who led the Bobcats’ defense with seven solo stops, one assist and two pass deflections. Dorian Williamson scored on a 10-yard run to cap the Falcons’ impressive start, an 85-yard, 12-play drive. Quarterback Xavier Malone, wrapped up by linebacker Xavier Washington, threw incomplete on a two-point try. Sackie burst up the gut for gains of 11 and 10 yards on his first two carries – a sign of things to come for most of the game. But the Bobcats couldn’t sustain their opening march after a sack by end Xavier Boatwright plus a penalty. Jahvere Weste had a 20-yard run to the Fulton 37 to open Central’s second series, but Boatwright sacked Trey Mitchell again and a holding penalty on the first play of the second quarter forced the Bobcats to settle for a 39-yard field goal by Eli Holbert. Facing a fourth-and-17 at its 48, a fake punt by Fulton came up short and left Central with good field possession. The Bobcats cashed in with a 29-yard touchdown run by Sackie to go ahead 10-6 with 2:22 showing in the first half. Mitchell rolled right and kept the ball for a key 16-yard gain at the start of the third quarter. Linebacker J’Coryan Anderson ended the Central threat by tackling Sackie for a six-yard loss and Holbert’s 49-yard field goal attempt was short. DaShaun McKinney hauled in two first down passes from Malone, but Sackie and Weste stopped Williamson for no gain on third-and-2 and JaShaun Fenderson shanked a punt 18 yards. Mitchell passed 16 yards to Louis McNair and scatback Michael Miburo scampered 16 yards to the Fulton 20. The Bobcats, however, had to settle for Holbert’s 31-yard field goal, which glanced off the right upright and through for a 13-6 lead with 47 seconds to go in the third. Fulton was still in the game when the fourth quarter began but couldn’t get anything going on offense. Rondrow Peebles returned a punt to the Fulton 32 and Sackie carried the ball five out of six plays to put Central in the end zone. His sharp cut to the right produced a 3-yard TD run and made it 20-6 with 8:57 remaining. The Falcons tried in vain to pass the ball to explosive Zack Dobson and had to punt again. Central put together four first downs and chewed up the clock. Holbert was wide on a 29-yard FG try. But only a minute remained. Central Coach Bryson Rosser said his team has made its most improvement in the running game since the first of the season. Weste had six individual tackles, one assist and one pass breakup. Sophomore linebacker Marcus Johnson had five solo stops and one assist.